Is There Honor in BYU’s Code? 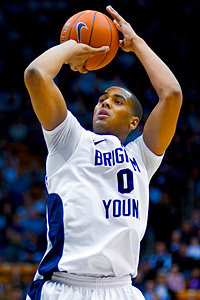 The fallout from Brandon Davies' suspension for violating BYU's honor code by reportedly admitting to knocking the boots with his girlfriend has been nothing if not predictable. There's "how great they're standing by their principles" from the punditry versus "you have to be f'ng kidding me" from the peanut gallery. I initially fell into the first camp, and, really, I'm still there. Anyone who attends BYU knows the score as soon as they sign up. I may not agree with the legitimacy of the rules themselves, but I do agree that the school has every right to determine its own code of conduct. If you're going to attend school there, you're playing its game. In fact, it sounds more appealing than the usual ad hoc approach of situational ethics that most major college athletic programs seem to follow when it comes to disciplining players. On its face, BYU's honor code should remove the confusion about what is and isn't permissible. Take a look at the BYU Honor Code, though. It outlines a number of different offenses, ranging from imbibing an earl gray to swearing to doing the nasty. Yet, there's no delineation in terms of severity, nor are there set guidelines for meting out punishment. Essentially, if you do break the rules, your fate lies in the hands of the BYU administration. Imagine if our legal system had no enforcement guidelines, but instead left everything to the discretion of some type of judge or tribunal. In other words, we know that everything from jaywalking to murder was illegal, but there's nothing to distinguish the egregiousness of different offenses. After a while, precedent would enable us to develop an understanding of the "order" of seriousness and what kind of punishment different offenses dictate - murder gets a life sentence in the big house; speeding gets a ticket; etc. It works so long as we can trust the people in charge of enforcing the law to do so responsibly. However, the system's general lack of transparency opens up all kinds of opportunities for abuse by those in charge of handing out punishment. The rules essentially justify any kind of punishment for any kind of offense. Anecdotally, however, I came up with four cases since 1997 in which male athletes were dismissed from their teams or the school for violations: Davies, Harvey Unga, Reno Mahe and Ronney Jenkins. Now, I have a sneaking suspicion that BYU students violate the honor code in some way about as often as Nick Saban commits an NCAA secondary violation. I can't imagine that athletes are any different, but you don't hear about scores of athletes getting dinged for breaking the rules. What concerns me is that in the four aforementioned cases, the athletes who were disciplined were all minorities. Based on that, is it fair to conclude that race plays a factor in how BYU enforces its rules? Not in the slightest. Unfortunately, we pretty much have to take that on faith.